Arabian Horse is the most popular horse breed in the world that has its origin mainly from the Arabian Peninsula. Having distinctive head shape and high tail carriage, the Arabian Horse breed is one of the most easily recognizable horse breeds in the world. Also, it is one of the oldest breeds in the world with archaeological evidence dating back 4,500 years. Throughout history, Arabian horses have been widely spread around the world both by war and trade and have remained an important means for Warriors. Talking about the appearance, all Arabian horses have a black skin under their coats and when these horses live in deserts this black skin will them to protect it from the Sun. The most common coat colour of the Arabian horses is bay; however, many chestnuts, grey, blacks and roans are available. The average height of the breed is approximately 57 to 61 inches and weighs is 850 to 1,000 pounds. The horse breed is courageous, sensitive and intelligent animals who loves attention. The Friesian horse breed has been originated in Friesland, Netherlands. Believed to be the most graceful and famed for their size, The Friesian horse breed is one of the most popular horse breeds in the world. During the Middle Ages, Friesian horses were in great demand and used as war horses throughout Europe. They are often found in black colour, with distinguishing characteristics. The rare beautiful black horse breed can participate in all sports and disciplines, however, mostly seen in dressage, or as a carriage horse due to their eye-catching movement. The breed gets its name from the land they were originated in Friesland, The Netherlands. One of the popular horse breeds is quite famous in the film and entertainment industry. It is featured in the movie Ladyhawke from 1985 that featured tallion named Othello. They are also seen in the movies like The Mask of Zorro, Eragon, and 300. The most popular colour is black, however, rarely they are seen as chestnut Friesians. The Carolina Marsh Tucky is one of the most useful animal breeds as they are easy to keep and can survive even in the toughest conditions. Often regarded as the real survivors, Carolina Marsh Tucky horse breed and have larger feet and gracious head that can be used for plowing, riding and much more. The Spanish descent belongs to the Colonial Spanish horses mostly seen in the American state of South Carolina. The small-sized horses can bear heat and humidity while they are moving in the swamps and marshes of South Carolina. The popular horse breed comes in Multi-colored patterns such as bay, roan, dun, black, chestnut, and grullo are seen. The breed can be as tall as 52-60 inches and weighs approximately 800 lbs. (363 kg). The lifespan of the breed is up to 30 years. The Andalusian originated in the Iberian Peninsula is a pure Spanish horse breed which was recognized for the first time in the 15th century. Known for their beautiful arched neck and convex profile, the Andalusian horse breed is found commonly in grey colour, but many other colours can also be seen. They are strongly built, compact elegant, have long, thick manes and tails. Also, they are well known for their intelligence, sensitivity and docility. Additionally known as Pure Spanish Horse or Pura Raza Espanola(PRE) known for its beautiful texture and have many qualities that make it one of the best and popular horse breeds in the world. The breed can be 60 inches in height and weighs around 1,129 lb. They are mostly seen in the US nowadays that are grey coloured, however, some are black, dun, palomino or chestnut in colour. The other colours include buckskin, pearl, and cremello but they are rare. The intelligent but shy breed are quick learners and you will have a quite delightful experience working with them. Miniature horses are found particularly in Europe and the United States but they can also be seen in many other nations. Miniature Horse as the name suggest are extremely small and that is why they are considered as horses and not ponies. Also, during pre-historic times, this breed was kept as pets by nobility and used for work in coal mines. In fact, today they are used as driving horses and sometimes even as service animals. They are known as miniature horses only when they measure less than 34” tall and according to the American Miniature Horse Association, they cannot exceed a height of 34 inches at the withers (End of the mane hairs). They are mostly used as service dogs for the blind and therapy animals in hospitals, or nursing homes. The miniature foals range from 12 pounds to 25 pounds at birth. The average lifespan of the horse breed is 30 years, however, some of the even lived to 50’s. The Appaloosa is an American horse breed which is one of the most popular horse breeds in the United States. The breed is best known for its colourful spotted coat pattern and is named after the official state horse of Idaho in 1975. in a number of western riding disciplines. They are tough, independent, hardy and sure-footed, with big bodies and sparse manes and tails. Appaloosas are often used as stock horses and pleasure mounts, and also make excellent trail horses. The Morgan horse is one of the horse breeds developed in the United States. Named after his best-known owner, Morgan’s were known for their versatility and commonly used as coach horses and for racing, as general riding animals in the 19th century American history. The Morgan is a compact, refined horse breed, that comes in a variety of colours. The light horse breed is also known as warmblood horse and adult one weighs around 1,500 pounds. They are mostly used as riding horses mostly for leisure and trail riding; however, most of them are used on the racetrack, show ring and on the ranch. They are visible in colours such as bay, brown, black, and chestnut. Talking about the appearance, they have a short head with a wide forehead and the face looks like a flat profile. Their eyes are large and bright with ears are small and well nicely placed. The Tennessee Walking Horse is a tall horse with a long neck. It is often described as the refined, elegant and solidly built horse breed. It has a well-defined head with small, well-placed ears and strong coupling. It was originally developed in the southern United States for use on farms and plantations. Also, The Tennessee Walking Horse breed is known for its unique four-beat running-walk and flashy movement. It is a popular riding horse due to its calm disposition, smooth gaits and sure-footedness. The horse breed has unique look with flashy” or “bright,” and usually created by cross-breeding six different breeds for being a standard utility horse. This is the primary reason they are tall and light but at the same time one of the strongest and popular horse breeds in the world. The breed comes in all colour variations that made them one of the most diverse set of horses in the world. 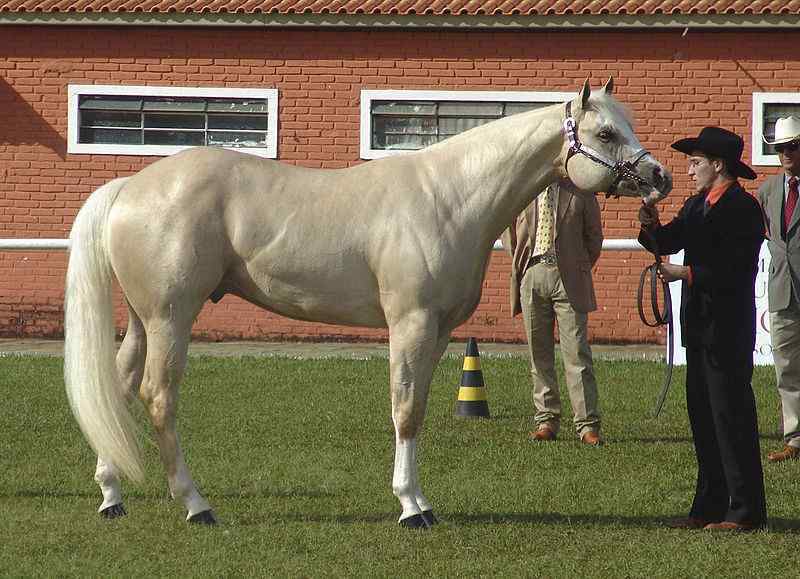 The most specific colour is Palomino and it is one of the rarest colours in the breed but it meets breed standards. The Thoroughbred is a horse breed best known for racing. Although the thoroughbreds are considered as “hot-blooded” horses they are well known for their agility, speed, and spirit. The Thoroughbred was developed in the 17th-18th century in England. Apart from racing, they are also used in other riding disciplines such as show jumping, combined training, dressage, polo, and fox hunting. One of the most popular horse breeds in the world is best known as a racing horse developed by mixing of Turkish and Arabian horses. The younger horse breed in the world because the development process has been started in 17th century England. The record for the highest jump has been attained by a horse named Huaso who jumped a total clearance of 2.47 meters and that is approximately 8 feet. American Quarter Horse, is an American breed of horse, named for its fantastic ability to outdistance other horse breeds in races of a quarter mile or less at speeds up to 55 mph. It is the most popular breed in the United States today, and is also the largest breed registry in the world, with almost 3 million living American Quarter Horses as in 2014. Also, this horse breed is well known for its performance in rodeos, horse shows and as a working ranch horse. These are the 10 most popular horse breeds in the world. Do post your comments.